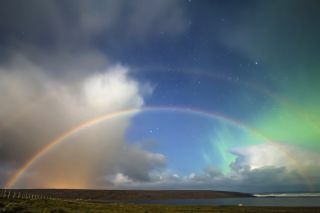 A double moonbow meets the northern lights under starry skies in this photo by astrophotographer Giuseppe Petricca. An explosion of colors lights up the evening sky as a rare double "moonbow" meets the northern lights in this stunning, star-speckled view. Astrophotographer Giuseppe Petricca photographed the moonbows, or nighttime rainbows, from the Isle of Lewis in Outer Hebrides, Scotland, on Nov. 7, 2017. Behind these gorgeous lunar rainbows shines the magnificent aurora borealis, or northern lights, which casts a green glow in the starry night sky. The northern lights are colorful light displays caused by charged particles from the sun (the solar wind) interacting with particles in Earth's upper atmosphere. These particles are drawn by Earth’s magnetic field to either the North or South Pole, resulting in the aurora borealis, or northern lights, and its southern counterpart, the aurora australis, also known as the southern lights. In the center of the photo is an iconic star pattern, or asterism, known as the "summer triangle," which contains three bright stars: Vega, Deneb and Altair. The brightest star in the triangle and in this image — Vega — is visible above the aurora to the right. Deneb is located on the upper edge of the image. The third star, Altair, is beneath the moonbows above a dark cloud. This captivating view isn't one Petricca will soon forget. "I could continue on and on to describe this view, but I think that the picture will do it way better. An unforgettable emotion," he said. Editor's note: You can see amazing night sky photos by our readers in our astrophotography archive here. If you have a night sky photo you'd like to share with us and our news partners for a possible story or image gallery, please contact managing editor Tariq Malik at spacephotos@space.com.